Turpentine oil is an aromatic oil that is extracted from various parts of the pine tree. It is not meant for human consumption (drinking or swallowing). Turpentine Oil Poisoning is the accidental or intentional intake (swallowing) of the compound. What is Turpentine Oil Poisoning? What are the Causes of Turpentine Oil Poisoning? What are the Signs and Symptoms of Turpentine Oil Poisoning? The signs and symptoms of Turpentine Oil Poisoning can vary from one individual to another. It may be mild in some and severe in others. Several systems of the body, such as the respiratory system, digestive system, urinary system, vascular system, and ENT may be affected. How is First Aid administered for Turpentine Oil Poisoning? Who should administer First Aid for Turpentine Oil Poisoning? 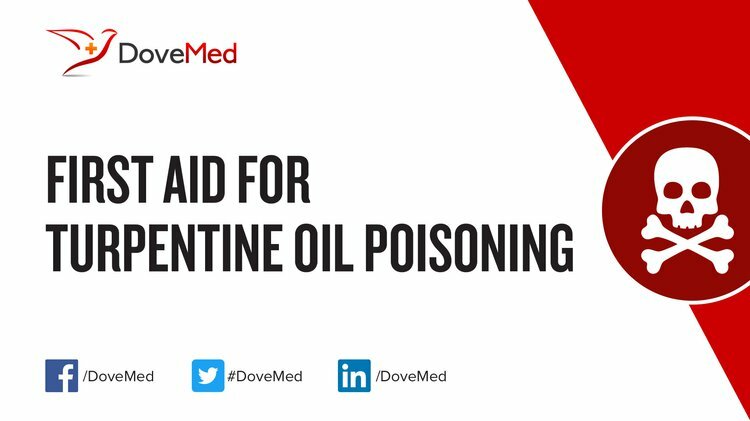 First aid for Turpentine Oil Poisoning is administered by healthcare professionals. What is the Prognosis of Turpentine Oil Poisoning? How can Turpentine Oil Poisoning be Prevented? Sadlon, A. E., & Lamson, D. W. (2010). Immune-modifying and antimicrobial effects of Eucalyptus oil and simple inhalation devices. Alternative medicine review, 15(1), 33-43. McKenzie, L. B., Ahir, N., Stolz, U., & Nelson, N. G. (2010). Household cleaning product-related injuries treated in US emergency departments in 1990–2006. Pediatrics, 126(3), 509-516. Vallinayagam, R., Vedharaj, S., Yang, W. M., Lee, P. S., Chua, K. J. E., & Chou, S. K. (2013). Combustion performance and emission characteristics study of Turpentine oil in a diesel engine. Energy, 57, 344-351. Martz, W. (2010). A lethal ingestion of a household cleaner containing Turpentine oil and isopropanol. Journal of analytical toxicology, 34(1), 49-52. Worwood, V. A. (2012). The Complete Book of Essential Oils and Aromatherapy: Over 600 Natural, Non-Toxic and Fragrant Recipes to Create Health Beauty a Safe Home Environment. New world library. Nakayama, F. S., & Osbrink, W. L. (2010). Evaluation of kukui oil (Aleurites moluccana) for controlling termites. Industrial crops and products, 31(2), 312-315. Kamatou, G. P., & Viljoen, A. M. (2010). A review of the application and pharmacological properties of α-bisabolol and α-bisabolol-rich oils. Journal of the American Oil Chemists' Society, 87(1), 1-7.